If you enjoy playing for life changing sums of money and dream of winning millions then progressive jackpot games are the way to go. Look at selection of the games on offer, you are sure to find some that appeal and with a bit of luck you’ll become our next jackpot winner. If you enjoy progressive jackpot games then you are bound to have come across the Age of the Gods series of slots, based upon the Ancient Greek myths and legends. The slots are linked to four huge progressive jackpots, the largest of which is worth well over £540,000, and they offer some fantastic bonus features. 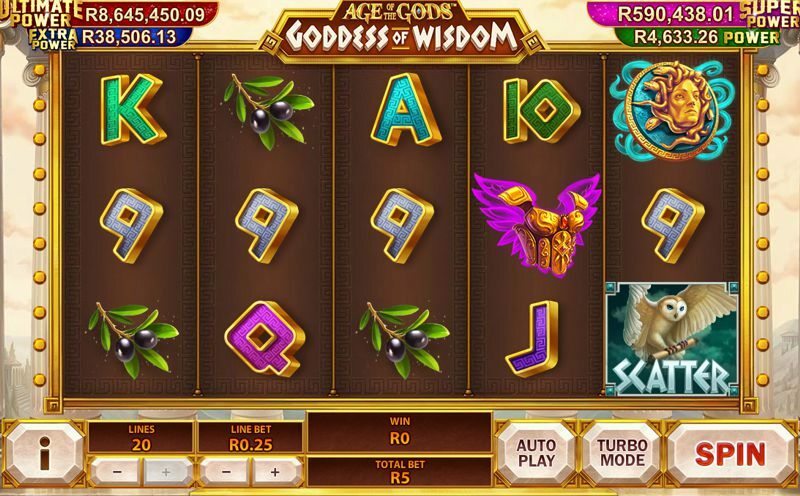 Age of the Gods: Goddess of Wisdom is based around the character Athena and it is a 5 reel slot with 3 rows and up to 20 paylines. Behind the reels you can see a view of Athens complete with an ancient Greek temple and stylistic pillars. There are five high value symbols, Gorgonian (a magic pendant showing the Gorgon’s head), helmets, armour, sandals and olive branches. The lower value symbols are the playing cards 9, 10, J, Q, K and A. The goddess Athena is the wild symbol, she can land on the middle three reels and will substitute for all the other symbols, except the scatter, to help and complete winning combinations. The scatter symbol is an owl carrying a scroll. There is no minimum bet to play for the progressive jackpot. All you have to do is play the slot and after any spin, even a losing one, the jackpot game can begin. Furthermore, once it starts you are guaranteed to win one of the jackpots. In the game you will see a 4 x 5 grid of coins and when you select one it reveals which jackpot it represents. Once you have found three matching coins you win the corresponding jackpot. From smallest to largest the jackpots on offer are: Power, Extra Power, Super Power and Ultimate Power. 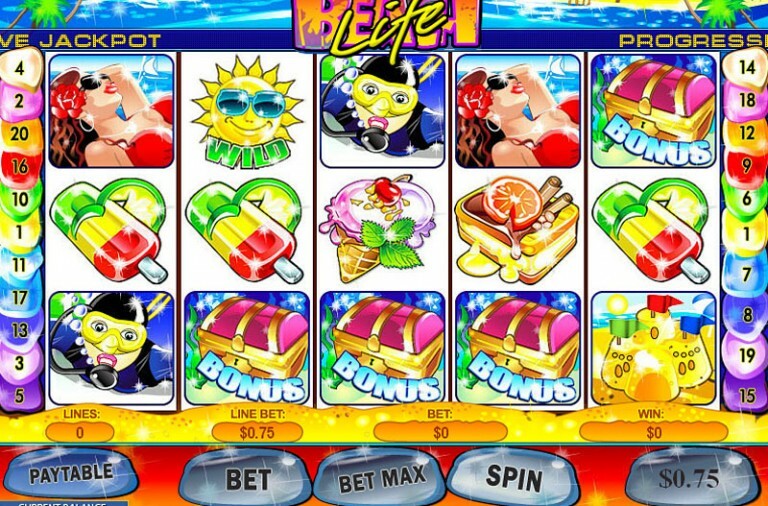 The slot also offers a bonus feature called the Battle Game and it begins when you land three or more owl scatter symbols anywhere on the reels. In the game the city is under attack and you need to choose how Athena will defend it. One of the high value symbols, the Gorgonian, the Helmet and the Armour, represents each defensive mode. Choosing the Gorgonian awards you 10 free spins, the Helmet awards 7 spins with a 4x multiplier and the armour awards 14 spins with a 2x multiplier. During the spins the chosen defence symbol will replace the other two symbols on the reels. As a result, there are fewer symbols on the reels and it becomes easier to land matching combinations. Better still, the wild symbol becomes an expanding wild for the duration of the spins. 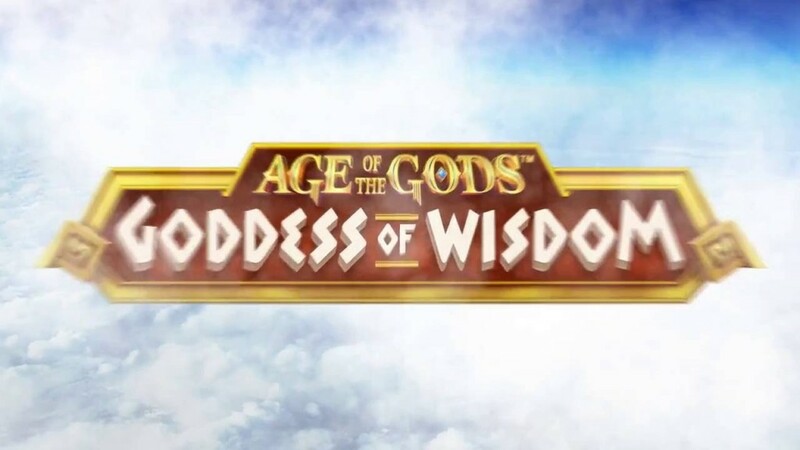 Age of the Gods: Goddess of Wisdom has a betting range of £0.01 up to £50 per payline so it is possible to bet anything from £0.01 up to £1,000 per spin. In addition to the progressive jackpots it offers a top fixed payout of 5,000x for landing five of the Gorgonian symbols, the armour and helmet symbols can both payout up to 1,000x, and the sandals and olive branch can both payout up to 500x. You can also win scatter payouts of up to 100x the total bet for a spin by landing five scatters anywhere on the reels. You are sure to enjoy this trip back to Ancient Greece and with a bit of luck, Athena in all her wisdom will grant you the huge progressive jackpot. Those that enjoy travelling are sure to love the trip to an ancient temple in Siam offered by Thai Temple slot. At the temple not only can you enjoy a range of bonus features, but you could also win a progressive jackpot worth over £418,000. 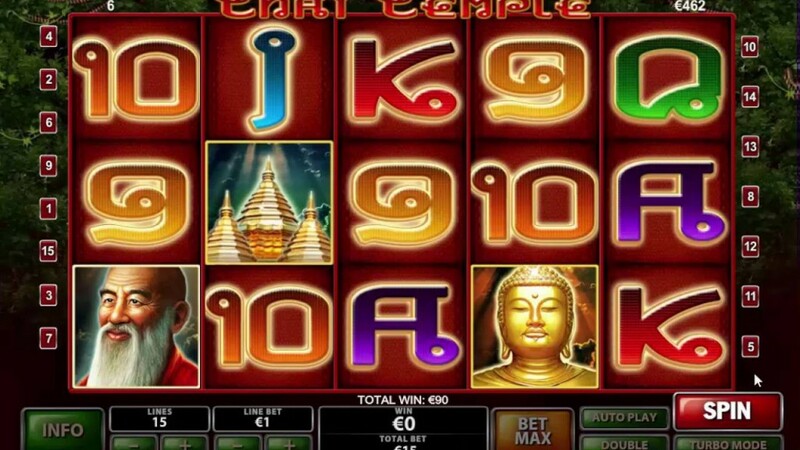 Thai Temple is a 5 reel slot with 3 rows and up to 15 paylines. Behind the reels you will see some dense jungle foliage. There are a number of theme related symbols and they include a tiger, a Buddhist monk, a Thai girl, a dragon’s head gargoyle and a dragon. The golden temple is the wild symbol, it can substitute for all the other symbols, except the scatter, to help and form winning combinations. Furthermore, whenever it helps to form a win the payout is doubled. To play for the progressive jackpot you need to activate all of the paylines and land five wild symbols across a payline. Depending on your bet level you will be playing for different portions of the jackpot. There are four jackpot levels: £1.50, £3, £6 and £15 per spin. The game also offers free spins that begin when three scatters land anywhere on the reels. 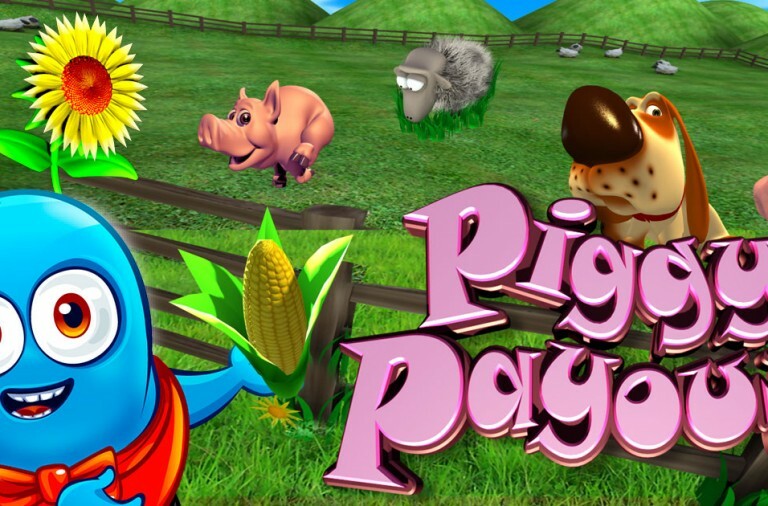 You will win fifteen free spins during which all payouts are tripled. Best of all, it is possible to retrigger the free spins up to a maximum of 165 spins and if you manage to do so then you will win a special payout of 500x the total bet. Those that enjoy risk taking will like the slot’s gamble feature. After any winning spin you can try and double your payout by picking a card that is higher in value than the dealer’s is. If you pick correctly you can repeat the process but one incorrect pick means all winnings are lost. Thai Temple has a betting range of £0.01 up to £15 per spin. In addition to the progressive jackpot there is a fixed top payout of 10,000x up for grabs if you can land five wild symbols along a payline. The two character symbols can both payout up to 750x, the tiger can payout up to 400x and the two animal heads can payout up to 250x. However, all of these payouts can be doubled if a wild symbol contributes to the win! If you feel like it’s time for a holiday abroad then give Thai Temple a spin and with a bit of luck you could soon win enough for the trip of a lifetime. Gladiator Road to Rome is one of the newest slots at Winner Casino and it is already offering a progressive jackpot worth over £1 million! The game is based upon the hit film Gladiator and will immerse you in the excitement of the Coliseum. 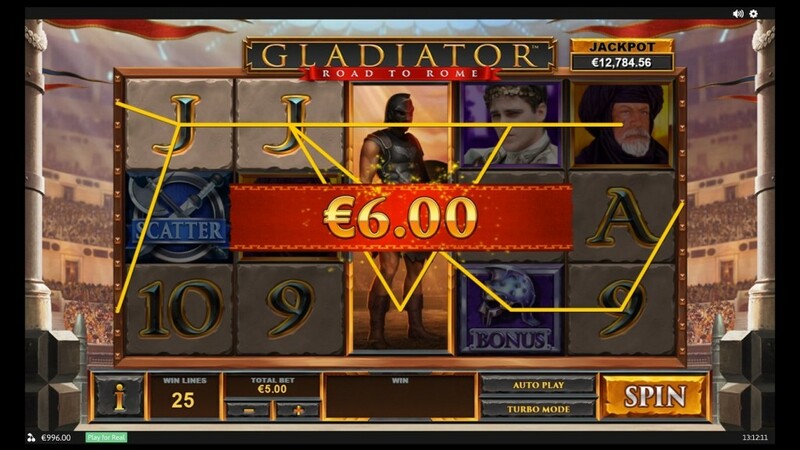 Gladiator Road to Rome is a 5 reel slot with 3 rows and 25 fixed paylines. The reels are set inside the Coliseum with flags waving on each side of the screen. The high value symbols are characters from the film including Commodus, Lucilla, Proximo and Tigris of Gaul. There is a special Gladiator symbol that can land stacked. If it fills the entire reel it will turn wild and substitute for all the other symbols, except the scatter and bonus symbols, to help and form winning combinations. The scatter symbol is a shield and weapons while the bonus symbol is a helmet. The progressive jackpot can be won via the Gladiator Bonus game. The game begins if you land the helmet bonus symbol on reels two, three and four at the same time. You will then see a screen containing nine helmets made from either bronze, silver or gold. Each of the metals is worth a different cash prize but if all of the helmets are made from gold then you will win the £1 million progressive jackpot. Extra Free Spins – Up to 3 more free spins. Win Multiplier – A multiplier of up to 3x. Symbol Payout Boost – This increases the payout of a random symbol by 5 times. Extra Wild Symbol – A random symbol becomes an extra wild during the spins. Symbol Pays as Scatter – A symbol is chosen behave as a scatter symbol. It will also expand during the spins. Gladiator Wild Nudge – When a Gladiator symbol lands partially on the reels it will be nudged to turn the entire reel wild. 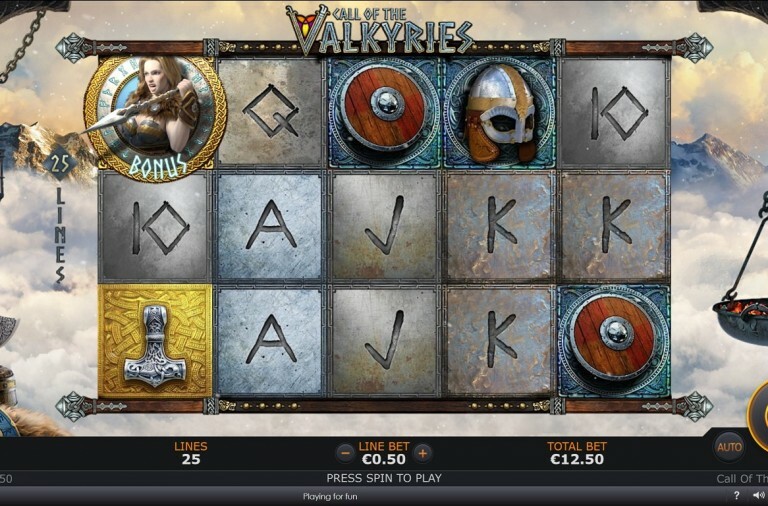 The slot has a wide betting range of £0.25 up to £125 per spin so it is very affordable. In addition to the progressive jackpot there is a top fixed payout of 1,000x available for landing five of the gladiator symbols along a payline. Commodus can payout up to 500x, Lucilla can payout up to 375x, Proximo can payout up to 250x and Tigris of Gaul can payout up to 250x. Why not travel back to Ancient Rome today and with a bit of luck you will win in the Coliseum and take home the huge prize.